Café Kranzler at the Hotel Baltschug Kempinski is a delightful restaurant to enjoy a casual lunch or dinner in Moscow. During our stay at the Hotel Baltschug Kempinski in Moscow, Russia, in November 2006, Edward F. Nesta and I took time to enjoy a light lunch and a lovely dinner at the pretty Café Kranzler. The hotel is located just a short walk from the Kremlin and St. Basil's Cathedral, and after a morning stroll exploring Red Square, the Kremlin, St. Basil's Cathedral, the churches, and the shops, we returned to the hotel to have lunch at Café Kranzler. The restaurant is located off the lobby of the hotel and features a comfortable ambience. The weather was brisk and cold outside, and the soups on the menu were very appealing and perfect for a cold day. 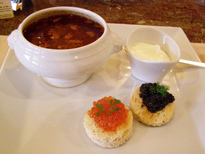 Edward selected the traditional Russian Borscht with Sour Cream, which was a thick, rich, and hearty soup paired with delicious Osetra and Salmon Caviar Canapés. I selected the Potato Leek Cream Soup with Lobster and Tarragon, which was lavish with succulent lobster meat, and the Pirozhki filled with Mushrooms and White Cabbage. The Pirozhki were two torpedo shaped breads, filled with a savory mix of minced mushrooms or chopped and seasoned white cabbage. Although Café Kranzler is highly regarded for their homemade cakes and pastries, which invitingly beckoned to us from behind the attractive glass display cases, we wisely decided to forego having dessert, as we would be having a gastronomic dinner that evening in the hotel's fine dining Restaurant Baltschug. The following evening we returned to Café Kranzler for dinner. After spending the day sightseeing in Moscow from the comfort of the chauffeur-driven Hotel Baltschug Kempinski Moscow's luxurious BMW 730Li limousine, it was wonderful to be able to return to the hotel and enjoy an evening of excellent cuisine in a casual setting. We had intentions to have a lighter dinner, and began with starters of Caprese salad. However, when the salads arrived, the size of the salads should have perhaps alerted us that our idea to have a lighter meal was about to be foiled. The salads consisted of ripe red tomatoes and three generous slices of fresh mozzarella di bufala topped with an abundance of rocket leaves drizzled with extra virgin olive oil, with a pool of balsamic vinegar in corner of the plate, and a dollop of pesto in the opposite corner. For Edward's main course, he selected Yellow Fin Tuna with Chinese Vegetables and Mashed Potatoes, which was a generous portion of tuna topped with julienne Chinese vegetables, surrounded with a pool of sauce, garnished with a mountain of crispy rice noodles, and accompanied with creamy mashed potatoes. I selected the Fettucini with Leeks, Prawns, and Salmon Caviar as my main course, which was plentiful fettucini laced with sliced leeks, a profusion of prawns, and this being Russia, crowned with a wealth of delicious orange salmon caviar. 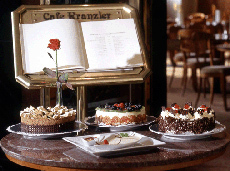 Having had the pleasure of enjoying both lunch and dinner at Café Kranzler, perhaps on our next visit, we might actually get to experience their homemade cakes and pastries!